Bullous pemphigoid can be a chronic remitting and relapsing condition. Bullous pemphigoid is an autoimmune disorder which is caused by the reaction of IgG antibodies against the hemidesmosomes of the epidermal of the basement membrane. 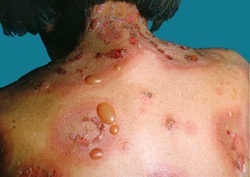 Bullous pemphigoid may present as blister which is fluid filled and itchiness/pruritus. Bullous pemphigoid is commonly affecting elderly person. The treatment of bullous pemphigoid include corticosteroid therapy. Pathologically bullous pemphigoid are presented with edematous dermis, bullae in the subepidermal area and perivascular infiltration of the lymphocytes and eosinophils. Investigation analysis may reveal the present anti basement membrane antibodies and the present of IgG deposition along the basement membrane as well as linear band of complement based on the immunofluorescence. 1.Nousari, Hossein C, and Grant J Anhalt. “Pemphigus and Bullous Pemphigoid.” The Lancet 354, no. 9179 (August 21, 1999): 667–672. doi:10.1016/S0140-6736(99)03007-X. 2.Jordon RE, Beutner EH, Witebsky E, Blumental G, Hale WL, and Lever WF. “BAsement Zone Antibodies in Bullous Pemphigoid.” JAMA 200, no. 9 (May 29, 1967): 751–756. doi:10.1001/jama.1967.03120220053008.